The 48th annual meeting of Society for Neuroscience (SfN), Neuroscience 2018, is the world’s largest neuroscience conference for scientists and physicians devoted to understanding the brain and nervous system. It is expected more than 30,000 colleagues from >80 countries will participate in this year’s conference, which will be held from 3-7 November 2018 at San Diego, CA, USA. 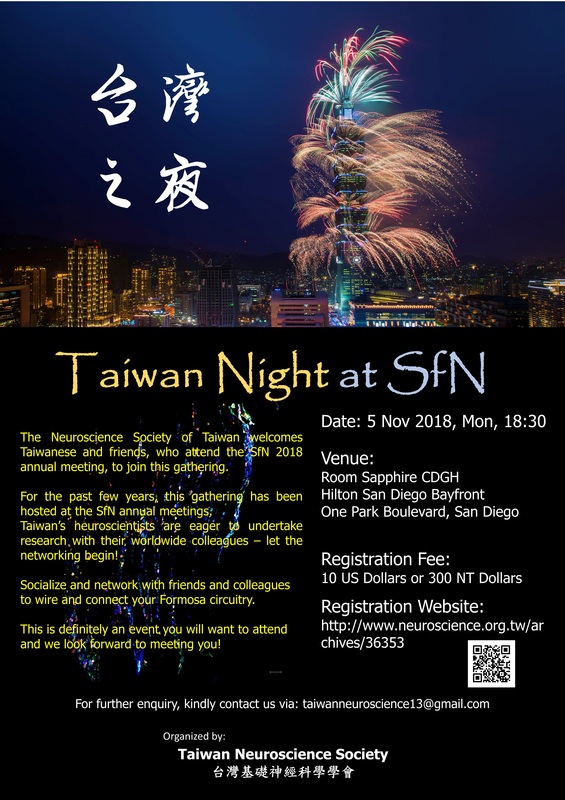 In conjunction with Neuroscience 2018, the Taiwan Neuroscience Society (TNS) will organize the “Taiwan Night 2018”, a satellite event approved by the SfN committee, with the aim to provide a platform for neuroscientists from around the globe to collaborate and network with peers, and to celebrate the research achievement of fellow Taiwanese colleagues. Please take note that the online registration portal is closed. Don’t worry, you may still register on-site on the day of the event. However, if the number of attendee exceeded the venue capacity, we would regrettably follow the first-come, first-serve basis. We look forward to meeting you @ Taiwan Night 2018! 當場報名(當場報名僅接受現金樂捐)。Cash payment on-site is acceptable in the form of donation.